Get this lesson & adjunct materials: request the package from Andreas.Prokop@manchester.ac.uk; a version for non-curricular school visits is available from our fighshare site. Summary: This lesson introduces to wiring principles of the nervous system, using a “discrimination task” experiment for the sensory nervous system which then extends to the motor system (e.g. explaining how the body distinguishes between bending and stretching the arm) and concepts behind epilepsy (including an experiment with epilepsy-prone mutant flies, emphasising the genetic nature of this condition). This leads over to the “5 steps to an action potential” module (~10 min), particularly suited for high achieving pupil groups. To illustrate the difference between seizure and paralysis, we use temperature-sensitive flies which, if kept for a few minutes under the arm pit display absolute (but reversible) paralysis. This provides opportunities to talk about the working and importance of synapses, as well as the topic of protein folding. An additional module on opto- and thermogenetics is more suitable for extracurricular school visits. 2. Wiring principles: “Decide to bend or stretch your arm!” What happens in your body? Figure 1. 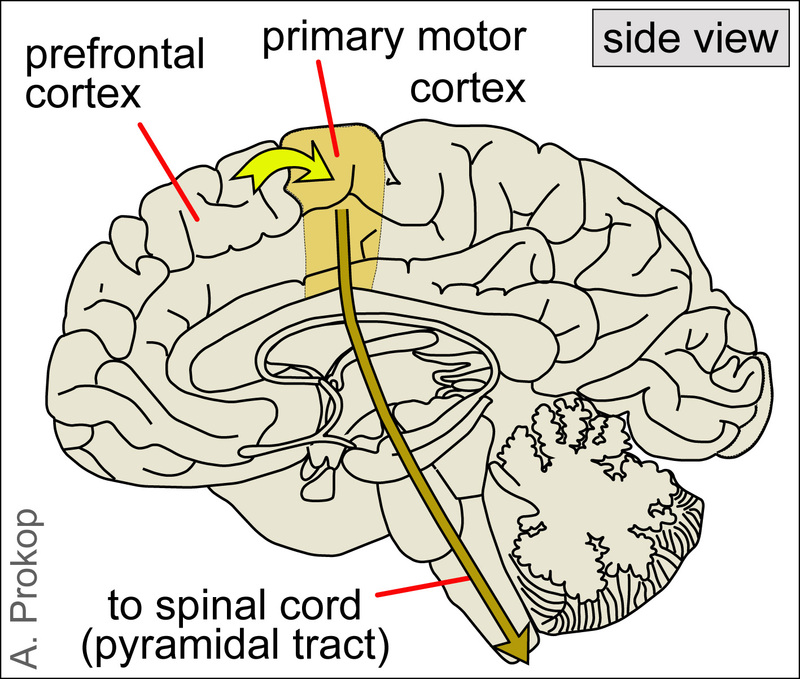 Decisions to make a movement are sent to the primary motor cortex (yellow arrow) from where signals are sent towards the spinal cord (orange arrow). (1) The “decision making” occurs in the nerve networks of your brain, likely of the prefrontal cortex (Fig. 1). The decision outcome is turned into action by stimulating adequate areas of the primary motor cortex (Fig. 1, yellow curved arrow). This brain region contains the upper motorneurons, also called pyramidal neurons, which project through the pyramidal tract into the spinal cord (Fig.1 and “1, 2” in Fig. 2). (2) As is typical of neurons, pyramidal neurons have tiny cell bodies (~50 µm diameter) and generate long (up to a metre long in humans! ), slender (~1 µm diameter) cellular processes called axons, which act as the cables that wire our bodies. The axons of pyramidal neurons (lighter blue) project from the primary motor cortex all the way down into the ventral horn of the spinal cord where they connect to lower motorneurons (Fig. 2, “A” and “B”). The pyramidal axons send high-speed messages in form of nerve impulses (Fig.2, right) all the way down from the brain to the spinal cord. 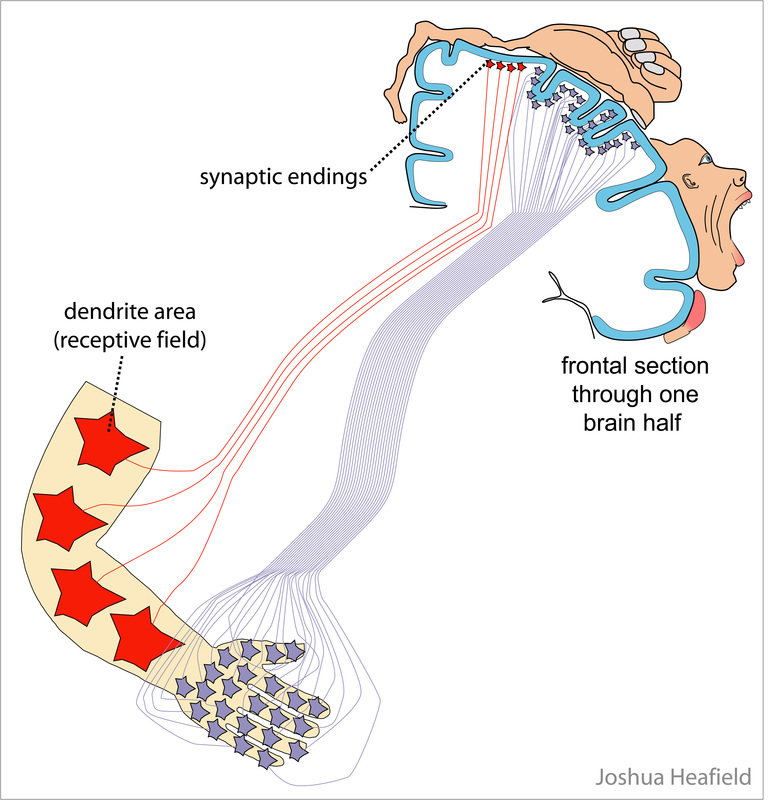 The connections they form with lower motorneurons are called synapses, which are highly specialised to pass nerve impulses on from one cell to another (see details further below). In this way, the nerve impulse can continue its journey into the arm, i.e. beyond the physical reach of the pyramidal neurons. Figure 2. The spinal cord receives information from the primary motor cortex via the pyramidal tract and passes information on to muscles via segmental nerves. Pyramidal neuron 1 stimulates the lower motorneuron A leading to bending, whereas pyramidal neuron 2 stimulates motorneuron B leading to stretch. (3) The spinal cord is the lower part of the central nervous system which is embedded in and protected by the vertebrae of our backbones and gives rise to the peripheral nerves that reach out into all areas of our bodies (Fig. 3, left). All lower motorneurons project their axons through these peripheral nerves (dark blue in Fig. 2) in order to form synapses with appropriate muscles (or gland cells) in their dedicated body regions, for example the extensor or flexor muscles in your arm (Fig.2, right). (4) Like neurons, muscles are excitable cells which can send electrical impulses across their surface, and this signal is requires to trigger muscle contraction (see more info about muscles here). Therefore, the pyramidal neurons which were stimulated when taking the decision to move your arm, will pass their nerve impulses synaptically on to lower motorneurons which, in turn, will send nerve impulses towards their dedicated muscles that will eventually undergo contraction as the intended outcome of your decision (Fig. 2). How does our decision to move the arm target the appropriate muscles in our bodies? How do we distinguish between activating leg versus arm muscles, or flexor (for bending) versus extensor muscles (for stretching)? (1) As the first level of order, our body is organised into segments from head to tail. Each segment is indicated by one vertebra in our backbones, and harbours one pair of peripheral motor nerves sending information towards muscles in that particular body segment (Fig.3, left). For example, the motornerves which innervate muscles of our arms exit from the C3-T2 area (red & yellowish green in Fig. 3) and those innervating our legs from the L1-S3 area of our backbone (bluish green & blue in Fig. 3). Therefore, when deciding to move our arms, we need to activate the particular group of pyramidal neurons in our primary motor cortex which form synapses with lower motorneurons in the C3-T2 region. (2) Within each segment of the spinal cord there is a second level of order. Thus, the cell bodies of the lower motorneurons are concentrated in one region on each side of the grey matter, called the ventral horn (Fig. 3, bottom right). Within the ventral horn, motorneurons are not randomly positioned, but they form a topographic map (greek: “topos” = place; “graphos” = something drawn or written): the neurons close to the midline innervate the muscles closer to the body axis (e.g. shoulder), and the neurons at the lateral end innervate the muscles furthest away (e.g. hand). Therefore, lower motorneurons are arranged into a fixed spatial pattern within the spinal cord which closely reflects the various areas of our body. Upper motorneurons can use spatial coordinates to find the right lower motorneurons when they form their connections during development. Figure 3. Pyramidal neurons are arranged into a body map (homunculus) in the primary motor cortex and lower motorneurons into segments along the spinal cord, forming a segment-specific muscle map in the ventral horn of each segment. (3) The third level of order is at the level of the pyramidal neurons in the primary motor cortex which are also arranged into a topographic map. This map reflects our entire body and is therefore consequently referred to as “homunculus” (latin for “little human”). Therefore, just like the lower motorneurons in the ventral horn of the spinal cord, also the pyramidal neurons are arranged according to the body position they command. As you can see, the head and hands have a far larger representation in the homunculus than the lower body, meaning that many more pyramidal neurons are used to coordinate our hands than our feet. This explains the enormous precision with which we can use our hands – or can you imagine to text an SMS with your toes? (4) By having understood these body maps and their hierarchical order, it becomes a bit easier to grasp how our brain can coordinate our movements in sensible ways. Of course, things are more complex. For example, there is a difference between you taking a voluntary decision to move your arm, versus an unexpected event where your arm is being moved passively. In the latter case, reflex circuits may be activated which automatically counteract the involuntary movement. Visit this link if you want to understand more about the wiring principles of reflex circuits. (5) Let’s deepen our understanding of the above mentioned wiring principles by looking at a number of disorders leading to paralysis in our bodies. For this, have a look at Fig. 4 and try to work out why the arm can no longer be moved in the different examples given. Figure 4. Different brain disorders leading to paralysis. Click image to enlarge. Spinal cord injury: Spinal cord injury often damages the axon tracts in the white matter of the spinal cord which lead towards (ascending) or come from (descending) the brain, and this includes the pyramidal tract. Damage to this tract will cut those pyramidal axons which innervate segments at and below the site of injury. 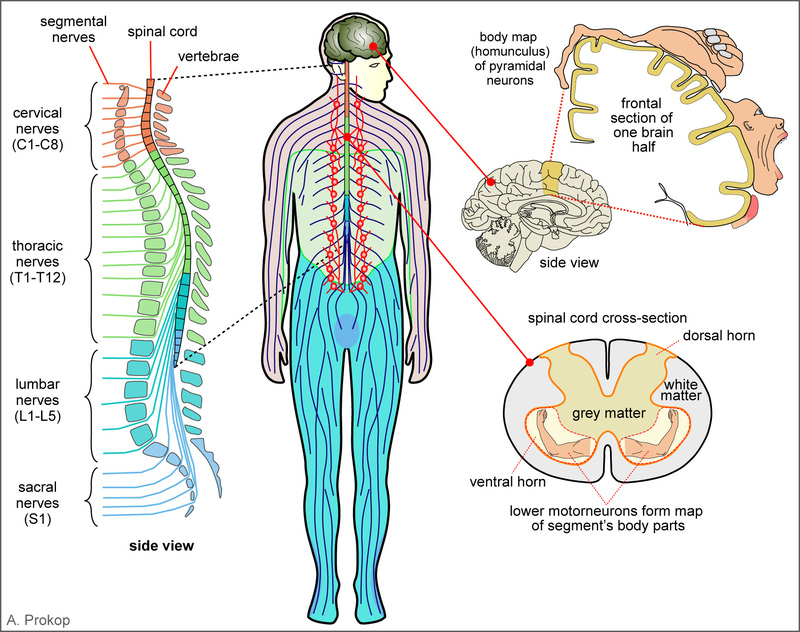 Hence, spinal cord injury close to the neck will lead to total body paralysis, whereas damage in the mid body region will paralyse lower body parts, such as the legs (see Fig. 3). Axons have the principal capacity to regenerate, but there are many factors in the damaged spinal cord which prevent this from happening. Researchers look therefore for tricks to overcome the barriers to re-growth (see this promising case). Stroke, tumours, brain injury: There are various ways in which our brain can become damaged: for example, (1) through brain injury, (2) through brain tumours which can affect the brain tissue around them, or (3) through stroke which represents sudden tissue death of a brain area caused by loss of blood supply (“ischaemic” strokes; e.g. through a blood clot) or the bleeding of brain vessels (“haemorrhagic” strokes). If these conditions affect the primary motorcortex (or pathways leading towards or from it), paralysis occurs in all those body areas which are damaged in the homunculus map (Fig. 3). This explains, why stroke tends to paralyse only one body half and certain body regions within. Unfortunately, lost pyramidal neurons can not be replaced, but our brain has “plastic” capacity, meaning that undamaged parts in the primary motorcortex may rewire and gain sensible control over the lower motorneurons which lost their original innervation. This explains gradual recovery possible in stroke, but also why it is unpredictable. Motorneuron disease: In motorneuron disease and some other neurodegenerative disorders (e.g. spastic paraplegia), upper and lower motorneurons or their axons are the primary sites of decay and lead to gradual onset of paralysis which often starts from the most distant muscles (i.e. those muscles innervated by the longest nerves). To be able to prevent or treat these diseases, we need to better understand the biological processes that go wrong in these neurons, and researchers worldwide are working on this task (e.g. see this film or read this article). Myasthenia gravis: In myasthenia gravis it is not the upper and lower motorneurons or their axons which are primarily affected, but specifically components of the neuron-to-muscle synapses formed between lower motorneurons and muscles ( 2). These synapses are qualitatively different from neuron-to-neuron synapses, thus explaining the selective effect. The common cause for this disease is that the immune system starts to aberrantly attack and remove transmitter receptors (see below) at neuron-to-muscle synapses, a condition referred to as “auto-immune disease”. To prevent or cure this disease, treatments must be found to stop the immune system from turning against our own bodies. (6) On the basis of what you have learned so far, what do you predict would happen if most neurons in the brain cortex fired at the same time? — The outcome is loss of body control. However, in this case, control is not lost because of failed muscle activation, but rather due to their uncontrolled contraction leading to epileptic seizure. In an epileptic attack, large brain regions become uncontrollably activated which is consequently passed on to lower motorneurons and muscles throughout the body. The simultaneous activation of muscles and their antagonists (e.g. flexor AND extensor) leads to body stiffening accompanied by tremor and seizure (see the lion in the video below). But what are the reasons for epilepsy? Before we can explain the underlying disease mechanisms, we first need to understand a bit more about the nerve impulses travelling along axons and the synapses at which the impulses get passed on to other cells. What is the nature of these events and what cell mechanisms are involved in their occurrence? Figure 5. The first four steps to an action potential. 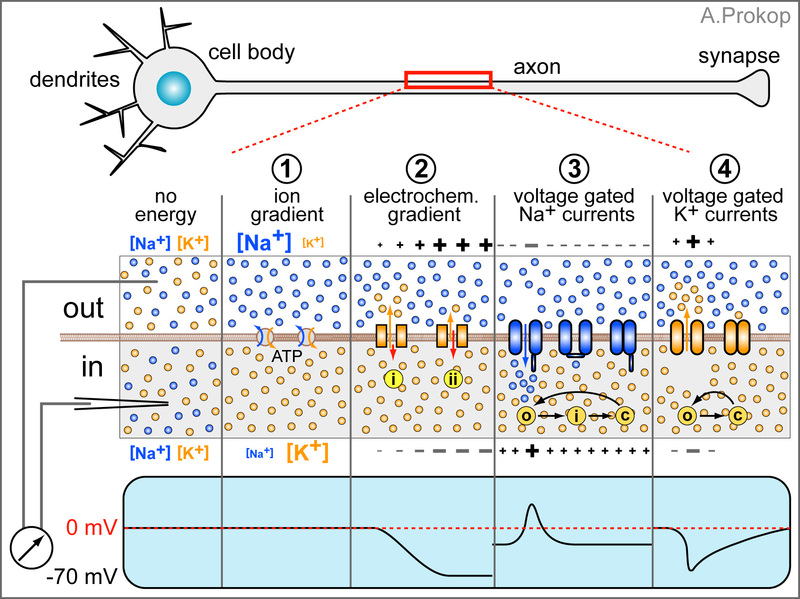 Image in middle row shows part of the membrane of an axon separating the in/outside of the cell (in/out), and the blue box below illustrates the measurement of its membrane potential. Click the image to see an animated version. Step 1: Live came to be in our oceans, i.e. water which is rich in inorganic ions such as sodium, potassium, calcium, chloride and many others. Cells are surrounded by lipid membranes, and ions can normally not pass through them. This allows cells to change the ion composition of their interior cytoplasm relative to their surrounding, for example store a high quantity of certain ions in their interior like marbles in a bag which cannot escape. To bring certain ions in and exclude others, they use proteins called ion pumps which are specialised to transport specific ions across their cell membrane. This is an active process which requires energy in form of ATP (mostly generated in their mitochondria). To increase efficiency and reduce energy cost, ion pumps often couple simultaneous transport of different ion, for example export of sodium (Na+) can be coupled to import of potassium (K+), a process referred to as antiport. Constant working of such pumps generates a high concentration of sodium on the outside and of potassium on the inside (“1” in Fig. 5). This process is not specific to excitable cells but occurs in all cells. Step 2: What would happen if you poked holes into this membrane? All the effort of ion pumps would be wasted and diffusion would lead to equal distribution of ions on both sides of the membrane again. What would happen if you poked tiny holes wich only let through a limited amount of potassium, but not sodium? Diffusion forces would drive potassium out of the cell, following the steep concentration gradient across the membrane. Through this continued unidirectional current, the outside of the membrane would get charged more positively (addition of positive ions) and the inside more negatively (loss of positive ions), and this would be measurable as an increasing voltage across the membrane (blue monitor at the bottom of Fig. 5). Indeed, membranes of cells are semi-permeable, i.e. they selectively let specific ions pass through at a certain rate. This occurs through specialised proteins referred to as resting or leak channels which form pores through which primarily potassium can pass (“2” in Fig. 5). However, the membrane potential which can be achieved via these channels is limited: the more negative the inside gets, the harder it is for the positively charged ions to leave because they are attracted back by an electrical force (red arrow in “2” of Fig. 5). At a certain voltage, the chemical gradient driving potassium out of the cell is as large as the electrical force attracting the ions back (Fig. 5 “2 ii”). This electrochemical equilibrium can be calculated using a special formula called the Nernst equation. In most nerve cells, such a steady state is reached at about -70 mV, mainly through potassium and a small contribution of sodium current. This potential is referred to as the resting potential, a phenomenon that occurs in all cells, but the height of the voltage is cell-type specific. Step 3: Excitable cells can make use of the resting potential through a specialised class of proteins, called voltage gated ion channels. These channels are ion-selective and can be opened and closed. The trigger that opens them is a reduction in membrane potential. For example, sticking a fine glass needle into a cell does not only allow to measure the potential across its membranes (Fig. 5, left side), but also to actively inject electrical current into the cell to reduce its potential artificially. When shifting the membrane potential for example to -30 mV, excitable cells show a sudden current influx of sodium (“3” in Fig. 5). 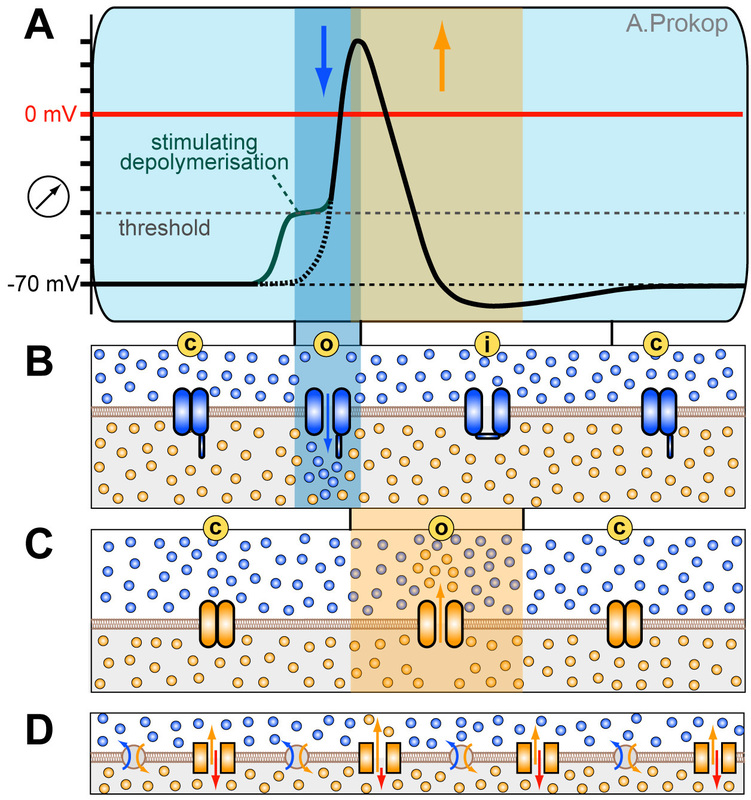 These are the currents of voltage-gated sodium channels, which are in closed confirmation (“c”) at resting potential but open up for ion flow (“o”) when the membrane potential shifts above a certain threshold. These channels tend to stay open for only a short time before they auto-inactivate (“i”) and then go into closed confirmation, ready to be opened again after a short refractory period. This refractory period is important to prevent that the action potential can revert its direction and flow backwards. Step 4. When shifting the membrane potential even higher to about 0 mV an outflow of potassium occurs (“4”). These are the voltage gated potassium channels which open (“o”) at higher thresholds than the sodium channels and close (“c”) more gradually and slower. As will become clear in step 5 it is important that sodium and potassium channels open at different thresholds. Figure 6. Step 5 is the actual action potential (A) which is achieved through integrating the steps 1-4 (B-D) in the right sequence; compare Fig. 5 for explanations and symbols. 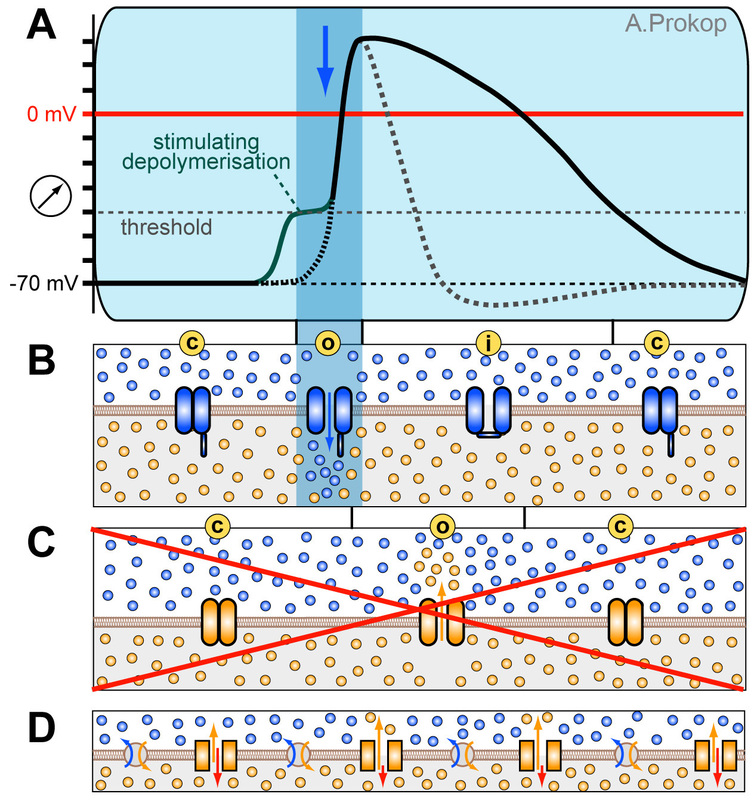 B) When an external stimulus shifts the membrane potential above threshold (red curve segment), voltage-gated sodium channels open and quickly close again (blue zone), driving the membrane potential to positive values (above red line). C) The increasing membrane potential triggers the opening of voltage-gated potassium channels which only close gradually, driving the membrane potential back to values below resting potential. D) Pumps and resting channels are contributing continuously; when the membrane potential changes, the rate of influx (red arrow) and efflux (orange arrow) of potassium ions through resting channels automatically shifts thus gradually bringing the resting potential back to normal values. Step 5:When all the different properties explained in steps 1-4 are put together in the right sequence, an action potential can occur (Fig. 6 and 7). When a cell is being activated (e.g. via synaptic input), sodium channels in this area will open first, driving the membrane potential to positive values. This depolarisation passively propagates along the membrane, quickly reaching further sodium channels which open and reinforce the depolarisation, thus actively driving a wave of depolarisation along the axon like a Mexican wave in a football stadium. The depolarisation is immediately followed by the opening of the voltage-gated potassium channels which quickly repolarise the membrane. This quick repolarisation is important to reset the membrane potential for new action potentials to come in and allow a high frequency rate of depolarisations in the range of mHz (1 mHz = 1000 events per second!). You may wonder why the action potential flows only forwards and not in both directions. On the one hand, this is due to the quick potassium-driven repolarisation below threshold levels. On the other, it is due to the refractory period of sodium channels who stay inactivatable for long enough to let the action potential pass by. This is comparable to spectators who have just played their part in a Mexican wave and know that they do not have to stand up again. Figure 7. The flow of an action potential within an axon; compare Fig. 5 for explanations and symbols. Top panel: the action potential at low speed (top) so that you can appreciate the series of events. Note that the membrane depolymerisation (inverted +/- in lower/upper line) propagates ahead of the area where sodium channels are actually open, thus triggering the opening of more sodium channels and driving the action potential like a Mexican wave along the axon. Lower panel: events at faster speed to give a slight impression of the enormous velocity at which these events occur (bottom). You may already have done a simple experiment where you vigorously shake vials with mutant fruit flies that are prone to epileptic attacks: whereas control flies are unimpressed by this treatment, the epileptic flies lie at the ground. Under the microscope you will see that they display leg tremor and convulsions of the whole body (see film below), very similar to the epileptic lion shown further up. This behaviour is displayed by a whole class of mutant flies, referred to as “bang-sensitive” flies, and the genes affected in these flies have been given rather creative names, such as slamdance, kazachoc and ether a go-go [LINK]. One of these mutations first discovered in 1948 affects the Shaker gene, which turned out in the late 70s to encode a potassium channel, and became then the first cloned potassium gene in 1987, i.e. 35 years after Hodgkin & Huxley discovered the action potential. Many of these “bang-sensitive” flies carry mutations in genes which either make membrane channel proteins or factors important for channel function. But why do these flies undergo seizure when heavily shaken? Let’s take the example of a Shaker mutation which affects a voltage-gated potassium channel. As explained in step 4 of the action potential model (see above), this channel is required for re-polarisation of the nerve cell (i.e. bring the membrane potential back to negative values). If the Shaker channel does not work properly, the nerve cell stays longer depolarised, i.e. it has problems to tone down its state of excitation (Fig. 8) and likely continues to excite other cells it is connected to. This might work out just OK under normal conditions, but becomes problematic if too many cells become active in the nervous system and stimulate each other, thus boosting the activity of whole neuronal networks or, in fact, the whole CNS (hence also the muscles which are activated by motorneurons!). When shaking flies, many of their sensory neurons get stimulated and send action potentials into the CNS, thus flooding it with activity, and this cannot be toned down sufficiently in Shaker mutant flies, leading to contraction of all muscles, hence spasm. When watching TV we occasionally get warned of flash photography, and this is because viewers may suffer from a photo-sensitive form of epilepsy – and this follows a similar logic as the shaking of flies. This analogy, together with the striking similarity of epileptic attack symtoms in a fly and a lion (see films above), might suggest that there are common traits between flies and higher animals and humans. Indeed, just like in flies, many human forms of epilepsy link to defects in channel proteins (referred to as “channelopathies”). Therefore, flies are being used to study disease mechanisms underlying epilepsy and to test strategies for improved drug treatments [LINK1] [LINK2]. Given the fact that flies are easy to keep in high numbers (Fig. 9), much of this research can be significantly accelerated, and findings can then be translated into models of higher animals or even moved forward to clinical trials on humans. Figure 9. Large scale drug testing is easy and cost-effective in flies. They are kept on feel containing different drugs or concentrations of drugs for a while and then tested: they are shaken and their recovery time is being measured as an indicator of the severity of their seizure condition. Effective drugs will reduce the recovery time. In this resource we mainly discussed rather simple neuronal networks. However, neuronal networks can be of far higher complexity. Just think of reflex circuits: if a doctor uses a reflex hammer to stimulate the tendon in your knee, this elicits a leg reflex where the lower leg mildly kicks forward (the stretch of the tendon implies that your leg has been bent, eliciting a reflex response to stretch it again; this is a constant regulatory mechanism which allows us to keep our body in balance without having to “think” about it). This is still rather simple. However, when testing the reflex, the doctor advises the patient to relax or even look away, and this is necessary because we can use our brain to switch the reflex off (and this allows us to bend our leg voluntarily without the reflex counteracting the movement and generating antagonising or even harmful tension). To learn how these reflex networks are wired have a look here. Neuronal networks become even more complicated when thinking of complex behaviours, such as learning. For example, how do we store memory? Take Alzheimer’s disease, where patients lose spatial memory. We know that a brain region most heavily affected in Alzeimer’s patients is the so-called hippocampus (so called because of its seahorse-like shape, and hippocampus is the scientific name for seahorse). We have known for a long time that loss of the hippocampus through injury or operation causes loss of spatial memory (and other learning modes), and for taxi drivers it has been demonstrated that their hippocampus is especially active when they navigate their way, and that their hippocampus even grows in size when they are learning their trade [LINK] [LINK]. As another example, fruit flies can learn to associate a certain odour with bad experiences (e.g. an electro shock) and will avoid that odour in future, even if it is experimentally no longer coupled with the shock (similarly, if you burned your fingers once, will you not hesitate to touch an oven plate again, even if it is switched off?). 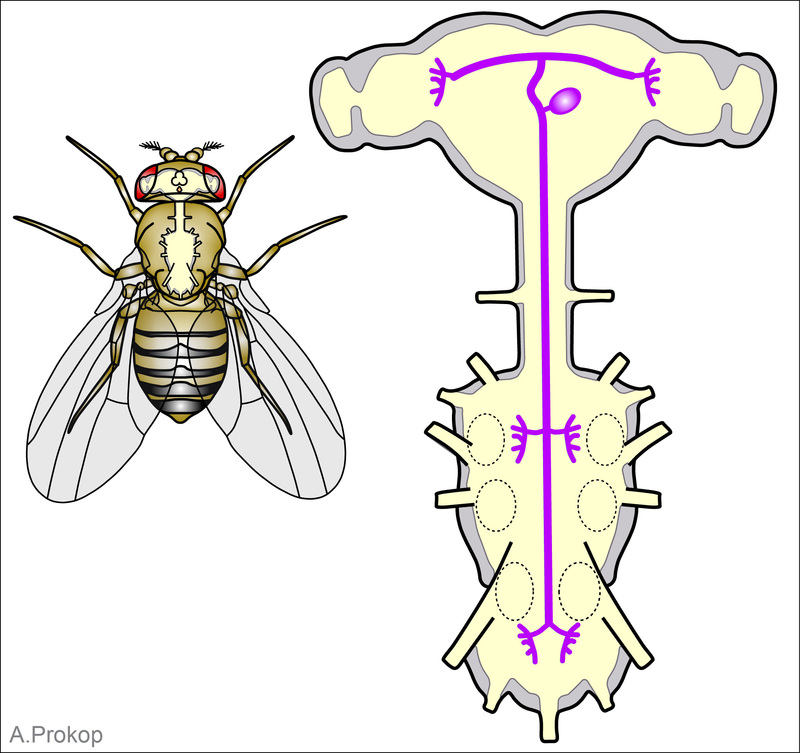 For this “associative learning”, flies require a brain region called the mushroom body. In order to understand these complex learning behaviours, identifying the required specific brain regions is the first step. As the next step, it is important to anatomically describe the nerve cells and networks they form within those regions, so that we can speculate/hypothesise about specific roles of the different neurons in those networks. However, to proof and fully understand their functions and contributions will require more complex analyses. We need to know (1) the patterns in which nerve cells are active in those networks (Can we identify underlying rules or principles? ), (2) what type of synapses the different nerve cells share with other neurons in the network (see next section), and (3) how the functional/behavioural output of those networks is changed when we manipulate (groups of) nerve cells within these networks experimentally (activate or inactivate them). To perform these experimental tasks, researchers have come up with clever strategies, referred to as opto- and thermogenetics (Greek: θερμός/thermós, “warm, hot”; ὀπτικός/optikós, relating to“light/vision”). The key principle behind these strategies is to use molecular genetic techniques to bring intelligently designed light-sensitive or emitting or temperature-sensitive proteins into specific sub-group of nerve cells; this can happen for two distinct purposes: (a) certain light-emitting proteins can act as sensors by making activity patterns visible (e.g. light up when a cell executes nerve impulses; see movie below); (b) certain temperature- or light-sensitive proteins can change the activity status of nerve cells if the temperature is increased or light of a specific wave length is shone on those neurons. The concept for optogenetic tools of the latter category is explained in Fig. 10. This movie shows a central nervous system of a Drosophila maggot where neurons express a calcium-sensing protein which shines up under the fluoresent microscope when the calcium concentration in nerve cells increases upon activation. This maggot is crawling which requires a wave of muscle contractions which is driven by a wave of motorneuron activity in the nervous system. Figure 10. Using optogenetics to activate a nerve cell. The algae Chlamydomonas has a light-sensitive eye spot helping it to move towards light (required for its photosynthesis). 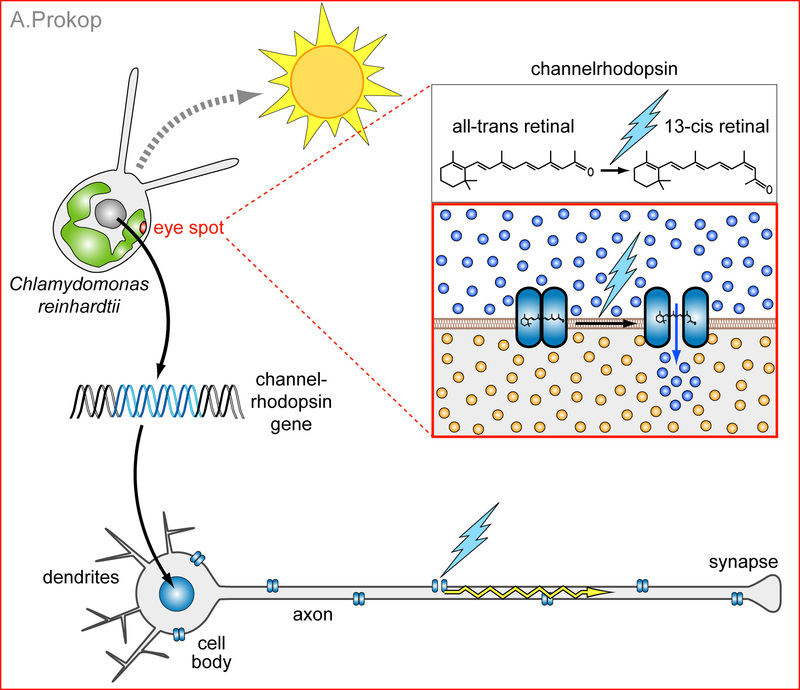 The light spot carries a sodium-selective channel protein (channel-rhodopsin, ChR) that opens up upon blue light (this is triggered by a conformational change of retinal, the same substance that photorecptors in our eyes use). The gene for ChR has been cloned and can be brought into specific nerve cells who then carry it on their cell membrane. Shining blue light on this nerve cells will open the ChR and let in sodium. As explained in step 3 of the action potential model (see above), this will trigger a nerve impulse. Therefore, shining blue light on these neurons triggers them to become active. The power of the optogenetic approach is explained with a simple example: flies show a flight response upon threatening visual stimuli (the response that makes it so hard to catch flies!). The key role of a specific neuron (giant fibre neuron) within this flight response can be clearly demonstrated using optogenetic tools in head-less flies (Fig. 11). Figure 11. The giant fibre neuron is required for a flight response. Visual information from they eye is quickyl transmitted via the gian fibre to motorneurons in the lower CNS to activate muscles that make the fly jump and and fly away. This whole program can be reproduced when stimulating these neurons via channelrhodopsin, even when the flies were decapitated (see movie below). Scientists discovered another nerve cell reaching from the brain into the lower CNS (Figure 12). To elucidate its role, they brought thermo-sensitive proteins into this neuron in order to specifically activate it by elevating the temperature to 30°C. The surprising outcome is shown in the movie below: activation of this neuron makes the flies walk backward (reminding of the moonwalk of Michael Jackson) [LINK]. Further fly experiments with optogenetic tools are described elsewhere [LINK1] [LINK2] [LINK3][LINK4], but let’s here briefly conclude our story line and come back to the hippocampus and mushroom body and their role in learning. Using optogenetic tools to activate specific cells in the hippocampus was used to manipulate (basically switch on) space-related fear behaviour of mice[LINK1] [LINK2][LINK3]. Using optogenetic tools to activate a small group of dopaminergic neurons adjacent to the mushroom body whilst providing a certain odor (in the absence of electroshock! ), was enough to make flies learn to avoid that same odor in future. These cells are therefore pivotal for integrating the electroshock element into the memory stored by this neuronal network [LINK]. Another group of nerve cells, likely acting after the dopaminergic ones, was enough to stimulate (in the absence of any training!) to make the flies run away from presented odours [LINK]. Therefore, optogenetic tools can indeed be used to study complex neuronal networks! Figure 13. Key events of transmission at electrical versus chemical synapses. At electrical synapses the two synaptic partner cells are thightly knit together, so tight that specialised proteins in their membranes can dock to each other and form a pore from cell to cell. This is comparable to the docking devices of rockets attaching to the International Space Station, forming a gate through which astronauts and materials can pass. In electical synapses, these docking devices between pre- and postsynptic cells are called gap junctions. Any nerve impulse reaching the presynaptic terminal can directly pass through these junctions, i.e. messages are passed on at high speed. Chemical synapses are far slower, because they translate the nerve impulse into a chemical message, to then revert it into a nerve impulse. For this, they contain little membrane vesicles filled with a chemical substance called neurotransmitter (red dots in Fig.). These vesicles are “docked” to the presynaptic membrane. When a nerve impulse reaches the synapse, voltage-gated ion channels (green in Fig.) open to trigger influx of calcium ions (Ca2+) into the the presynaptic terminal. The calcium binds to specialised “fusion” proteins which form part of the vesicle docking machinery. When triggered by calcium, these proteins actively fuse the membranes of the docked vesicles with the presynaptic membrane. This process exposes the interior of the vesicles to the outside space and the neurotransmitter is released into the synaptic cleft and can now diffuse towards the postsynaptic membrane. The postsynaptic membrane harbours transmitter receptor proteins (red in Fig.) which are specialised ion channels. When transmitter binds to them, this triggers their ion channels to open and let (primarily) sodium ions in. This sodium influx depolarises the postsynaptic membrane. If this depolarisation is strong enough to reach and open voltage-gated ion channels (white in Fig. ), a nerve impulse is elicted in the postsynaptic cells. Note, that the figure shows a further important process: vesicles bud off the presynptic membrane towards the interior of the presynaptic terminal. This process is referred to as synaptic vesicle endocytosis and is required to maintain the synaptic vesicle pool. These vesicles are equipped with specialised transmitter transporter proteins which re-load them with transmitter molecules. For more detailed information about synapses, see the “Layman’s guide to synapses“. You may find it surprising that the majority of synapses in our nervous system is chemical rather than electrical, although transmission at chemical synapses is so much more complicated and slow. The explanation for this lies in the enormous ability of the nervous system to process information, learn and adapt. Firstly, chemical synapses do not simply pass the message on, but they can change its meaning. For example, an action potential reaching an excitatory synapse elicits an action potential in the postsynaptic cell. In contrast, an action potential reaching an inhibitory synapse, prevents postsynaptic cells from firing action potentials (see further explanations here). Note that inhibitory synapses are therefore a means to tone down activity in neuronal networks; accordingly, inherited forms of epilepsy can also be linked to gene mutations that affect inhibitory synapses, apart from those affecting channel proteins (see above). Secondly, chemical synapses can change the quality of information transfer over time. For this, the process of translating a nerve impulse into a chemical signal and back provides many mechanistic steps which can be modified. For example, when being used a lot, synapses can adapt by desensitisation (for example to selectively block out irrelevant background noise during a conversation) or by enhancing synaptic transmission (referred to as “increasing synaptic strength“; for example during learning processes). Synaptic strength can be increased through lowering the threshold for transmitter release, increasing the volume of transmitter being released per event, raising the number or the opening probability of transmitter receptors. Any of these changes makes transmission at these synapses far more effective and likely and changes therefore the way in which an incoming action potential is passed on to other cells. When we learn or train our bodies, such changes of our chemical synapses occur constantly, and their ability to “fine-tune” makes chemical synapses important “intelligent” components of neuronal networks. In contrast, gap junctions at electrical synapses provide a limited range of possibilities to introduce “intelligent” changes. The power of synapses can be demonstrated with a simple genetic tool: the temperature-sensitive allele of the shibire gene (shibirets). As shown in Figure 14, the Shibire protein (in higher animals the same protein is called “dynamin”) is required to cleave recycling vesicles from the presynaptic membrane. Figure 14. As shown in Figure 13, vesicles are recycled from the presynaptic membrane. For this, a clathrin coat (red dashed line) causes a vesicular infolding of the membrane, which is then snipped off by Shibire (green ellipse) so that the vesicle is released into the synaptic terminal (shedding its clathrin coat). Animals that lack Shibire function cannot survive. 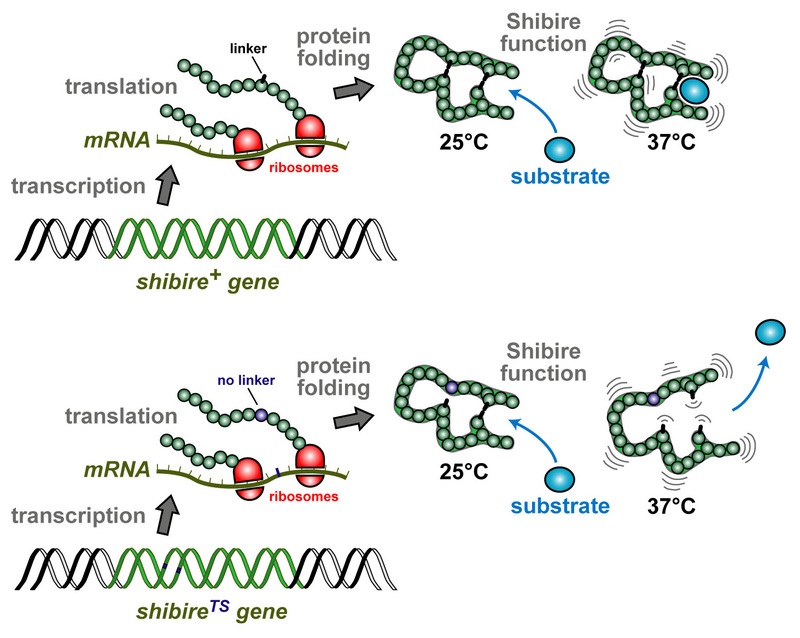 Therefore, scientists use a trick: they generated small mutations of the shibire gene which affect protein stability in a way that they lose their function only if the temperature is raised – in the case of shibirets to ~37⁰C (Fig. 15). Figure 15. Principle of a temperature sensitive allele. Proteins are amino acid chains, produced by ribosomes from an mRNA template through the process of translation. These amino acid chains take on a three-dimensional confirmation important for their function (secondary, tertiary and quaternary protein structure, as explained here). Proper folding requires that amino acids in certain positions have certain abilities (e.g. are flexible, form an angle or interact with other amino acids). If, due to a mutation, amino acids critical for protein structure are replaced by other amino acids (e.g. blue amino acid in lower image), the protein may still be functional but less stable. Raising the temperature increases kinetic energy which, in turn, causes the protein to unfold and stop functioning. If neurons have the shibirets allele and the temperature is elevated to 37⁰C, Shibire stops working and recycling vesicles are no longer cleaved off the presynaptic membrane and are found to accumulate as clathrin-coated pits at the membrane or form larger tubular structures instead (Kosaka & Ikeda, 1983). When these synapses are activated, they quickly use up their existing vesicles but cannot recover them through recycling. In consequence, these synapses stop working (see animation in Fig. 16). Figure 16. A synapse where Shibirets has been switched off by raising the temperature to 37⁰C. Due to its temperature-dependent functional properties, Shibirets is a thermogenetic tool (see Section 6). If it is targeted to be produced only in a few specific neurons, these neurons can be “switched off” upon elevation of temperature, and the effect on fly behaviour can be studied (thus elucidating the function of these specific neurons). For example, it has long been known that the neurons of a brain region called the “mushroom body” are required for certain forms of learning; if these neurons are switched off using shibirets, the learning is impaired (Kasuya et al., 2009; and see this LINK). If flies have shibirets in all neurons, they become paralysed for about 20 minutes – and this can be achieved by keeping a vial of these flies for 5 minutes under your armpit! Note that paralysis is very different from seizure: in seizure, flies show uncoordinated movements due to synchronous contraction of most or all muscles (see film in Section 5); in paralysis, all muscles are relaxed because they do not receive synaptic stimulation, hence flies are motionless. Having gone through key principles of the motor system and how to study it, let’s briefly have a look at the sensory nervous system and the underlying principles. The most commonly known senses are smell, taste, touch, hearing and sight. Smell and taste require specialised cells in our nose (olfactory receptor neurons in nasal epithelium) and mouth (taste receptors in taste buds) which detect certain chemicals that define the aromas and flavours of our environment, food and drinks. Touch requires mechano-receptive neurons in our skin and toungue which detect mechanical forces such as poking or shearing of the skin. Hearing requires mechano-receptive hair cells in the cochlea of our inner ear which sense the vibration of the inner ear fluid induced by sound waves (essentially mechanical stimulation through the pressure waves of the air). Vision requires light-sensitive photo-receptor cells in the retina of our eyes which detect light waves (see our L5-Vision resource for more detailed information). All these senses have in common that they detect information from the environment. Further senses belong into this category, such as detection of temperature or harmful substances (which burn the skin; referred to as nociception) and, to a degree, balance & motion detection (vestibular system of the inner ear). When looking across the animal kingdom, other such senses need to be added, such as electrolocation, echolocation, magnetoreception etc. Further perceptions inform us about our inner conditions including hunger, thirst, CO2 content in the blood, the angle of joints or the tension and contraction state of our muscles. To a degree also inner pain (internal wounds or inflammation) can be added to this list. Figure 17. Our most prominent senses. Details in the main text. All these stimuli are detected by specialised cells or endings of sensory neurons able to turn the specific stimulus into nerve impulses of sensory axons that project through various cranial nerves (nerves of the head) or tracts in the spinal cord towards specialised regions in the lower brain and from there to the cortex for final processing that enters our consciousness (details in Fig. 18). Lets focus on the touch sense to explain the principle. Figure 18. A sting with a needle elicits a nerve impulse in sensory neurons of the skin (red); note that these sensory neurons have their cell bodies in the dorsal root (DR) ganglion. The nerve impulse travels through the sensory nerve to the spinal cord where it is passed on via synaptic contacts to spino-thalamic neurons (orange) which project all the way up through the spinal cord to the thalamus; in the thalamus, the message is passed on to third order neurons which innervate the somatosensory cortex. 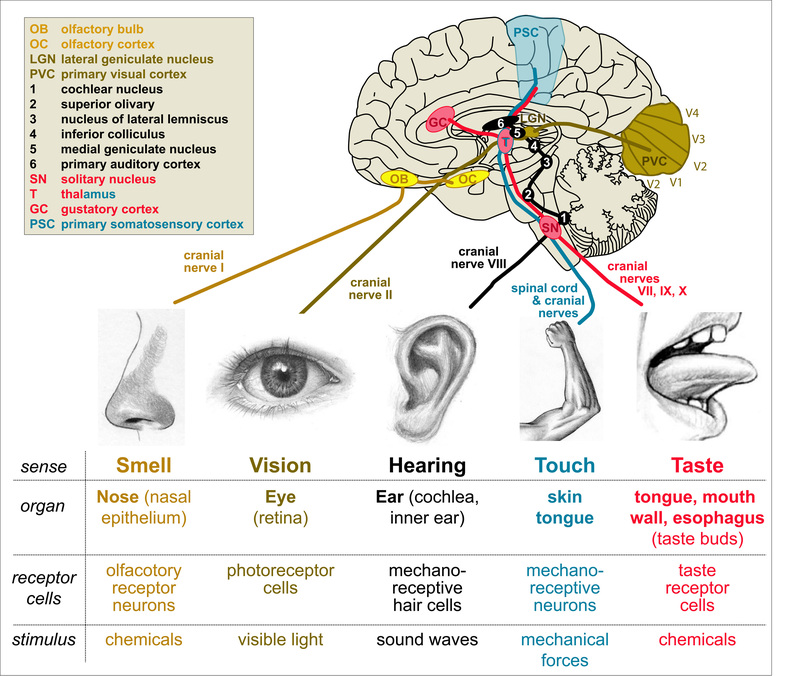 Analogous to homunculus maps of the motor system (see Section 3), also sensory information is mapped out in the brain. The motor map is wired into the primary motor cortex (orange in Fig. 19), whereas the sensory map is wired into the primary somatosensory cortex (light blue in Fig. 19). Figure 19. Sensory information terminates in the primary somatosensory cortex (light blue) where the underlying wiring diagram is organised into a “homunculus” map. The primary somatosensory cortex lies immediately behind the primary motor cortex (see Fig. 3). If you have a close look at the homunculus map, you will observe that it is strongly distorted. Hand, face and tongue are strongly over-represented, body arm and legs are very small. To understand why this is, you can do a simple experiment called the “discriminiation task” which is shown in the following movie. In this experiment you will experience that two toothpicks poked on the skin of your arm with a distance of a centimetre (or even more!) are felt as if they were only one toothpick. In contrast, on your hand or finger you can distinguish two toothpicks even if they are closer than a centimetre apart. In other words, you can discriminate stimuli with far greater resolution on your hand than along your arm. The explanation for this is given in Fig. 20: the skin of your hand contains a far greater number of sensory neurons than the skin of your arm. Accordingly, many more axons are sent from the hand area, and their more numerous synaptic endings occupy a far greater area within the primary somatosensory cortex, thus explaining why the area reflecting the hand of the homunculus is so much bigger than the area reflecting the arm. However, you may wonder how it can be that you can apply a toothpick to any area of your arm and you always can feel it, although the number of sensory neurons is so low. The answer lies in the receptive field of these neurons: each neuron sends out receptive processes across a large are of the skin, thus covering all skin surfaces (a phenomenon referred to as “tiling”). On the arm, it is therefore very likely that two toothpicks poke you within the receptive field of only one such neuron, and only this one neuron sends a signal which you therefore experience as only one toothpick. The receptive field of sensory neurons in the hand is far smaller, so that toothpicks are highly likely to poke receptive fields of different sensory neurons which, in turn, send separate signals that are resolved as distinct events in the brain. Figure 20. 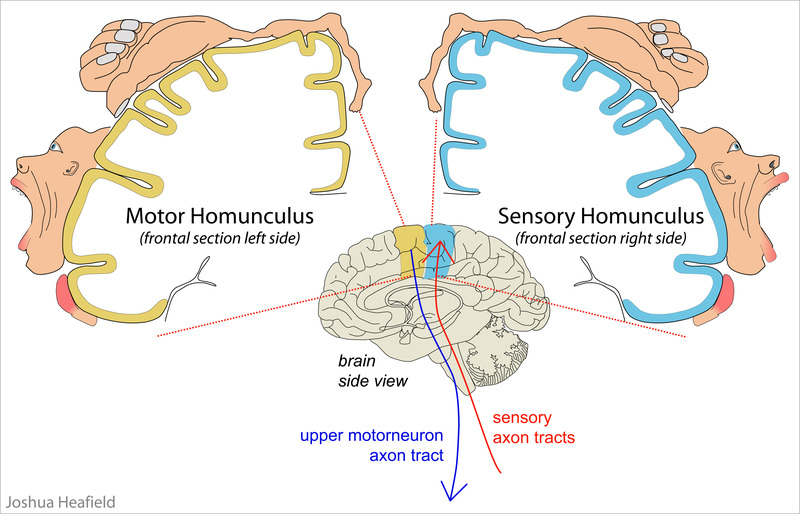 Principle of receptor density and receptive fields in relation to the homunculus map in the primary somatosensory cortex. Hi can you give me information to cite this page. I was wondering what date this post was published and the institution associated with this page.